Community Party on Thursday and You're Invited! When I was young, potlucks, “hoedowns,” and seasonal celebrations were the center of rural life. Everyone brought a favorite dish and anyone who played a portable instrument showed up (unfortunately, some budding musicians should have been plowed under). Going out to dinner at a restaurant just wasn’t done and everyone got up so early that dinner parties generally ended before dark. 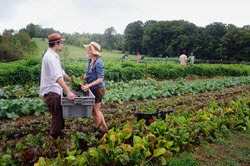 It isn’t easy to find this type of experience in modern days, but Heartwood Fable Collective Farm, commonly known as the Barnard CSA (Community Supported Agriculture), has revived the hoedown aura with their weekly “pickups.”For those who haven’t encountered the CSA idea, it is a concept that seems to be gaining traction, particularly in these parts. A group of farmers (in Barnard’s case, two brothers, Jon and Christopher Piana and co-owner Justin Park) collect share money from local community members. They farm the land, with the help of interns, and everyone in the community reaps the joys of fresh produce, which they pick up every Thursday evening. Every age group is represented at the weekly pickups, which have evolved into a veritable farmers’ market they call the “Feast and Field” Market. The market is held at the Clark Farm on the Royalton Turnpike from about early June to mid-October—there, you’ll see tiny babies, teenagers, college kids, young adults, parents, grandparents…did I leave anyone out? You’ll also see people of all types—those who are more comfortable in suits and ties, others who prefer tie-dye, and many who tend more toward blue jeans or Carhartts. Some people bring their own food or food to share, while others buy tacos, made with ingredients raised by the farmers, cooked by the farmers, and served by the farmers. If you ask Christopher Piana about their vision for the farm, he’ll tell you “it’s an amalgamation of our experiences traveling around and seeing things.” I like the word amalgamation, but I have to admit I think he’s been using this word with more frequency since they started making cider. Talk about an amalgamation worth testing out. This isn’t like the cider you’ll find on the shelves. The farmers take pride in their brewing methods and the rich flavors that result from good old fashioned care, attention, and love. This isn’t the type of market where you pick up your produce and head home. The Heartwood Fable Collective hoped to create a community environment, a space where people can gather, families can come, children can play, and people can eat good food and hang out. They wanted to create a space that would attract young people, who often flock to the cities after college to experience cultural and artistic engagement. For this reason, they offer an eclectic selection of dinner music at every pickup (and you never want to plow these musicians under). They have also developed a theater, which attracts actors from New York City who enjoy time the farm through the summer months as they prepare for an end of season performance. The Heartwood Fable Collective Farm is always evolving to meet the needs of the community. They began at the center of Barnard, selling pizza and offering music, a community gathering space, and a venue for local artisans. They have evolved into a smoothly functioning market that includes vendors, music, and theater while maintaining the open family and community atmosphere that continues to attract a large and friendly crowd every single week. If you are interested in living in this type of community then look at our home listings for the Woodstock-Barnard area.